The PBS-AP from Auray is an elegant, concert-style premium wood piano bench with adjustable height, suitable for use in a concert hall, studio, or at home. The wood construction features a durable ebony matte finish that provides a stylish and luxurious look that matches many pianos, keyboards and décors. The upholstered antique-style black seat provides comfort through many hours at the keyboard. The seat height can be precisely set by the performer, even when seated at the keyboard, by using the height adjustment knobs found on each side of the bench. 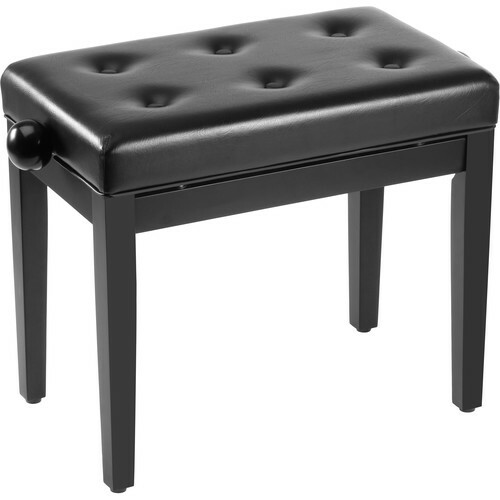 Box Dimensions (LxWxH) 27.3 x 13.6 x 6.0"
PBS-AP - Adjustable Premium Piano Bench with Upholstered Top is rated 3.2 out of 5 by 5. Rated 1 out of 5 by Monkey with a Typewriter from Terribly product. Avoid avoid avoid avoid avoid. The stool works by twiddling the two knobs on each side to raise or lower the seat to the required height. However, the whole seat assembly is attached to the stool frame using only four 1 screws. After about six months of very infrequent use by our 3-year old, who even a year later weighs less than 40lb, the first of the screws stripped out of the frame making the stool unstable and quite probably dangerous. I've tried various means of keeping the screws in, but in the ensuing months they've all eventually stripped out. I've now just lashed the seat to the frame with a length of nylon rope. So. It's now not adjustable, and it sure as heck isn't premium. It's a perfect combination of very poor design, and very poor construction, and I imagine that anyone who didn't take the time and effort to try and fix it -- and who weighed more than my daughter -- would have flung it straight into a landfill brimming with tons of other 'made-in-China' tat. Don't get me started. Rated 5 out of 5 by Samantha Music and Piano Teacher from Great Product A Around Easy to assemble, durable, very comfortable, great price, stylist, best of all adjustable. Rated 4 out of 5 by Anonymous from Good height adjustable piano bench It is perfect for my daughter, I could adjust the bench easily and she is very happy with it. Rated 5 out of 5 by Roman from Must have. Bought this bench with Yamaha DGX-650. How firm is the padding on this bench? I am pretty bony, so I need a good amount of cushion. The pad is kind of firm and not comfortable for bony. Does the foam contain toxic flame retardants? Does the label say it is in compliance with TB117-2013, which does not use such chemicals?